The Knickernappies website got a makeover! It's been a long time coming and was very much needed. Our Knickernappies website finally got the makeover it deserved. Our new layout features the latest blog posts, makes it easy for customers to connect with us on Twitter and FaceBook, showcases our fabulous lineup of products and most importantly helps customers connect with our retailers for all of their Knickernappies purchases! 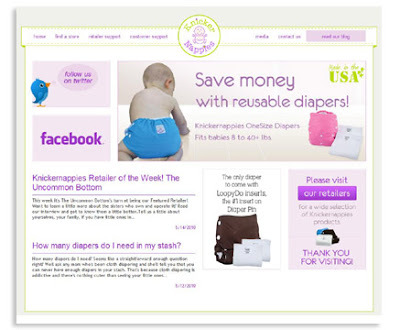 This week's Featured Retailer is Cloth Baby Bums! Leaving on a jet plane...with cloth diapers! Do you worry about the snaps on your diapers? Do you really fold your diaper laundry? How many diapers do I need in my stash?